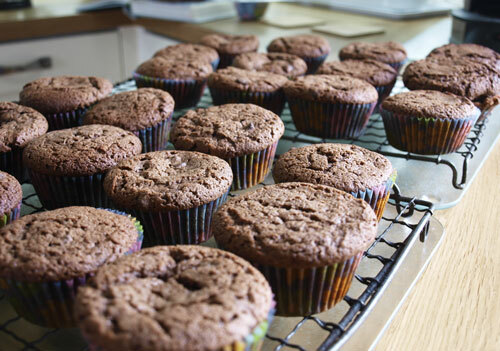 In order to prevent overdosing on chocolate birthday cake, I suggested to Mr Farmer that we had chocolate muffins for this birthday rather than a 7" or 8" cake! He was quite happy to go with this, especially when I found this recipe by Paul Hollywood on the UKTV Good Food Channel. It is a really interesting recipe, it uses strong bread flour and after you make the mixture you chill it in the fridge for 2 hours. 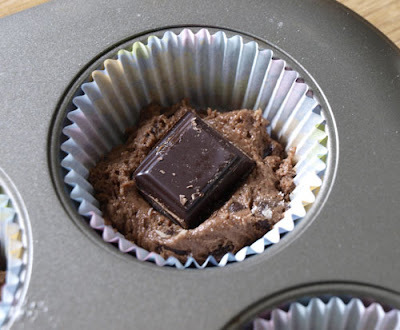 Then you put a teaspoonful in the bottom of the muffin case add a square of dark chocolate and then more muffin mixture on top. The muffins are very moist and and airy. When served warm, the chocolate in the middle is gooey and melting. If cold then it doesn't go completely hard again, just not so gooey. I can really recommend this recipe, it is high fat, high sugar and absolutely delicious, so most of the rest of the muffins are destined for Mr Farmer's office to remove them from temptation! Oh, yum! Interesting recipe. So I can eat a tin of muffins for my birthday instead of a high calorie slice of cake ;) I like that idea!~ Especially these muffins! PS Happy Birthday to your husband! Hi Janice. I am new to your blog and these cupcakes look simply amazing. Yummy! I don't normally care for cupcakes (they seem a little over-exposed in the blogging world) but these look great! Think it's the chocolate that does it. Anything that requires standing or chilling tends to put me off a recipe but with your lovely write up I will have to learn to be patient and wait for my food! They look delicious, I like the look of that nice chunk of chocolate in there! I was going to ask if you have any left but since your husband has taken them to the office, I think I know the answer! I just spotted you've got a craft blog - I'm going over for a peek! They look delicious! It's an odd method to put the batter in the fridge, but it obviously works well, and it must be lovely to find the chunk of chocolate in the middle! Forever Nigella #6 Sea Fish & Eat it!